Trailer for Safety Not Guaranteed. Aubrey Plaza, Mark Duplass and Jake Johnson star in the time travel comedy based on the real classified ad made famous by Jay Leno and YTMND.com. 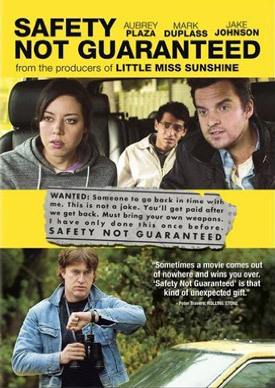 Watch the movie trailer for Safety Not Guaranteed below. When an unusual classified ad inspires three cynical Seattle magazine employees to look for the story behind it, they discover a mysterious eccentric named Kenneth, a likable but paranoid supermarket clerk, who believes hes solved the riddle of time travel. From the producers of Little Miss Sunshine – When an unusual classified ad inspires three cynical Seattle magazine employees to look for the story behind it, they discover a mysterious eccentric named Kenneth, a likable but paranoid supermarket clerk, who believes hes solved the riddle of time travel and intends to depart again soon. Together, they embark on a hilarious, smart, and unexpectedly heartfelt journey that reveals how far believing can take you.